What’s Is Prayer: Getting Results in the War Room All About? 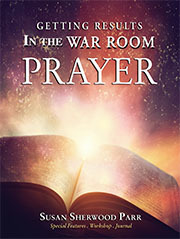 The book Prayer: Getting Results in the War Room contains scriptural facts to answered prayer that will significantly change your life. Readers gain a new enthusiasm about their prayer lives and how the Lord is working in their lives when they get into this workshop. Just a few of the features in the book? Prayer groups using this teaching have seen answers to their prayers in the national news. It has been a true source of excitement for all participating. Good for group study or individual study. “Lord, make prayer and my time with YOU as necessary food…and I’ll give You all the glory”? Try it! He will definitely answer you. Can’t you imagine…God loves it when we pray that way. THAT is an unselfish prayer PLUS it is a prayer that causes us to come close to the Lord. He does love that.